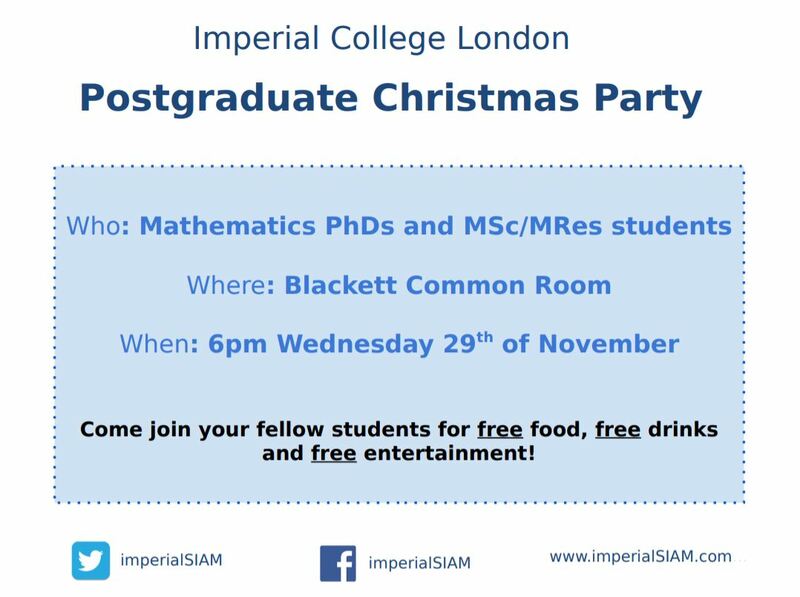 We are very excited to invite you to the annual Imperial College London SIAM Student Conference! You can look forward to a full day of student talks as well as exciting keynote speakers in many different fields of mathematics (PROGRAMME HERE!!!). Simulation based on numerically solving PDEs is a core challenge in computational mathematics. This is the only field in which entire top 50 supercomputers are procured for a single class of problem. However, the productivity of simulation software creation is spectacularly poor, with the combination of application, equations, numerics, and various levels of performance engineering creating a code so complex that advances become prohibitive. PhD students frequently spend the majority of their research time re-implementing known techniques in huge legacy programmes just to reach the starting point for their research contribution. The Firedrake project tackles this productivity crisis by taking a radically different approach to simulation software creation. Scientists and engineers create simulations by writing the finite element form of the PDE in high level mathematical code, similar to Mathematica or Maple. Firedrake then uses specialised compilers to apply a sequence of mathematical transformations to this code, each one applying some part of the discretisation and performance optimisation pipeline. The result is a system which is both highly productive and which facilitates the application of optimisations which would be intractable to apply by hand. In this talk I will lay out how the Firedrake system works, and show some of its mathematical capabilities. In recent years, the use of deep neural networks in Reinforcement Learning has allowed significant empirical progress, enabling generic learning algorithms with little domain-specific prior knowledge to solve a wide variety of previously challenging tasks. Examples are reinforcement learning agents that learn to play video games exceeding human-level performance, or beat the world’s strongest players at board games such as Go or Chess. Despite these practical successes, the problem of effective exploration in high-dimensional domains, recognized as one of the key ingredients for more competent and generally applicable AI, remains a great challenge and is an active area of empirical research. In this talk I will introduce basic ideas from Deep Learning and its use in Reinforcement Learning and show some of their applications. I will then zoom in on the exploration problem, and present some of the recent algorithmic approaches to create ‘curious’ reinforcement learning agents. We will also have prizes for the best speaker and the best poster. If your abstract for a talk is accepted we will reimburse travel expenses up to £50, with expenses for poster presenters covered subject to availability. Free food: morning coffee, pastries, lunch and afternoon snacks! Programme: TO BE CONFIRMED SHORTLY. This year the ICL-UCL day is going to be held at UCL on Friday 27th of April. If you are interested in joining us, please sign up here: https://goo.gl/aFEGC7! Here is some basic info for the day. Location: Room 505, University College, 25 Gordon St, London WC1H 0AY. It will be a fantastic day full of all kinds of maths from differential geometry to probability theory and mathematical physics. Prepare for fun to be had, horizons to be broadened and free food to be consumed. Alessandro, a Quantitative Researcher at G-Research, discusses the impact Artificial Intelligence attempts to have on imperfect information games such a Poker. AI has been dominating games like Chess for long time, and last year’s success of Alpha-Go proved that super-human performance is achievable also in a game like Go, where the extremely large number of states (game-tree complexity of 10^360, more than the estimated number of atoms in the visible universe) makes a brute force approach completely hopeless. Yet, a new frontier for AI is yet to be broken: imperfect information games, with Poker on the frontline. What makes those problems hard to solve is the deep, intricate entanglement between current actions and future rewards. 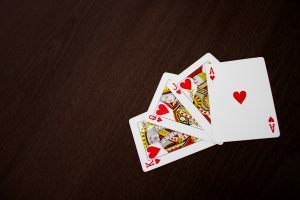 The value of a specific state will strongly depend on the full history of the game (which defines what the opponent can infer about our current hand, and vice versa). This makes the problem highly non-Markovian, and much more difficult to tract than complete information games, where selecting the best valued action in each tree bifurcation is sufficient to guarantee convergence to optimality. On the contrary, any Nash equilibrium strategy in poker is by definition stochastic, and much more complicated to infer. In the recent months, exciting progress in the field has been achieved by two independent research groups, under the project names of “DeepStack” and “Libratus”. Both groups managed to outperform (with good statistical significance) professional poker players in Heads-Up Texas Hold’em, which is one of the simplest variants of the game. While Libratus still holds some mystery around its approach, DeepStack revealed its secrets in a paper early this year (DeepStack, Matej Moravcik et al, 2017). Not surprisingly, DeepStack strategy is not very different form the used by Alpha-Go (in its original version): they both use a function to approximate the value of potential future states (value net) and one to encode most likely actions given a specific situation (policy net). Moreover, they both rely on deep neural networks to learn and represent those functions. In addition, DeepStack combines those networks with an approach called “Counterfactual Regret minimisation”, which allows to deal with the imperfect information nature of the game. Despite the recent success, AI powered computers are still unable to compete with professional poker players in the full Texas Hold’em nine players no-limit game. Moreover, even in simple variants of the game (like Head’s up, solved by DeepStack), AI can beat professional players, but when playing against non-expert opponents professional players still have a lead. In fact, expert humans are able to maximise profit by observing, categorising and adapting to different classes of sub-optimal players, and they are much more efficient at doing it than any existing AI. An AI Poker revolution would be very interesting to follow from various perspectives, and the large amount of money involved in the Poker industry is probably one of them. Currently, the online-poker market is estimated to sum to about 50 billion dollars, doubling in the last 5 years, and consistently growing. Despite not being able to beat professional players yet, it is very likely that most currently available AI can statistically outperform the average poker player found on those websites. Online poker communities are fighting against the use of bots in tournaments and cash games, yet AI-controlled agents are becoming harder and harder to detect, and Poker rooms have little more authority than just banning certain players from their specific platform, nothing preventing them from registering again under a different name. As in many other industries, the development of AI can have a disruptive effect on the world of poker. The development of statistically advantageous ways to “gamble” (and to make a consistent profit out of it) is not something new. It happened in the past for Blackjack (“Beat the Dealer”, Ed. Thorp, 1962) and in the finance world with algorithmic trading (“Beat the Market”, Ed. Thorp, 1967). Yet, counting cards in Blackjack has been easy to overcome with some game rules’ changes (frequent reshuffling of cards), while in finance algorithmic trading is sustainable (being investment a positive-sum game), and it actually proved to be beneficial for the whole system, by improving efficiency and liquidity of the financial markets. But Poker is a negative-sum game: the expected gain of the average player will always be negative as long as there is a dealer collecting fees. Whether online Poker as we know it will be able to survive the AI revolution remains unknown. Despite the recent progress and successes, Artificial Intelligence is still very far from being solved, and it is hard to forecast what it might lead in the future, either applied to making money in online Poker or transporting people with self-driving cars. After all, AI has been able to beat the best human players at chess for 20 years now, yet a 5 years old kid is still much better than any AI-powered robot at moving the Chess pieces on the board. G-Research is a leading quantitative research and technology company based in central London. We use scientific techniques, big data and world-class technology to predict future movements in financial markets, and develop the platform to deploy these ideas globally. Find out more at: www.gresearch.co.uk . The annual Maths Department Christmas party is here! This year, we are hoping to make it really special for you with lots of little surprises! Keep your diary free on the Wednesday 29th November! Please fill the following form so we know your dietary requirement! Hope all of you can make it! 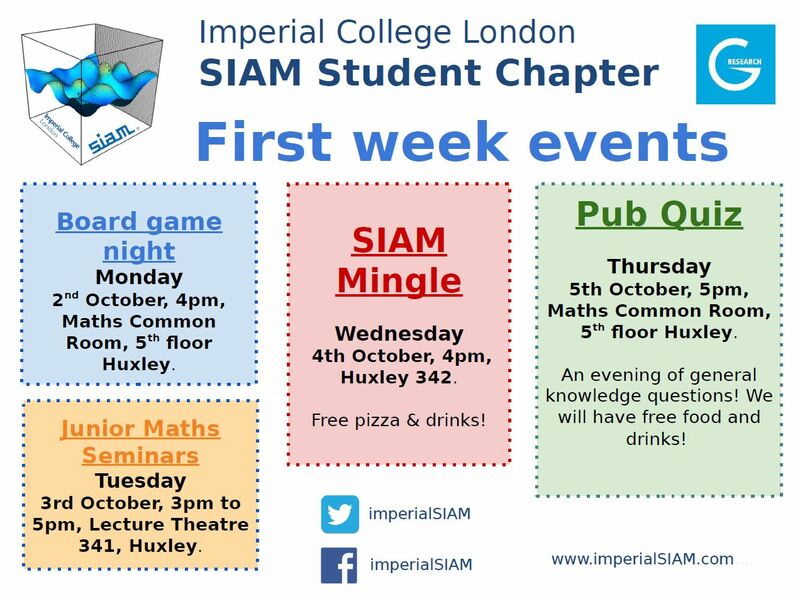 For the induction week next week, we are organising a series of exciting events to welcome the incoming PhD students to join our big family at Imperial. As usual, all PhD students are invited. Please join us at those events, make some new friends and have fun! We are delighted to announce the 3rd Annual Conference of the Imperial SIAM Student Chapter. It will be held at Imperial College London on 19th of June. This is where it takes place (zoom in to see the building, take the elevator to the 5th floor and you will see us). Please see below for titles and abstracts of the talks. Abstract: Compatible finite element methods are numerical discretisation methods based on sequences of finite element spaces that are compatible with the classical vector calculus identities “div-curl = 0”, “curl-grad = 0”. This compatibility turns out to be important for establishing stability of numerical discretisations. I will introduce these methods, review some results from the field (recently expressed in the finite element exterior calculus), and explain how they allow us to build numerical schemes for geophysical fluid dynamics that have long-time stability and conservation properties. Abstract: I will discuss three examples of large-amplitude waves in the ocean, and how canonical nonlinear wave equations are being used to model them. The three cases are: rogue waves, modelled by the nonlinear Schrdodinger equation; tsunamis on the continental slope and shelf, modelled by a Korteweg-de Vries equation; internal waves in the coastal ocean, modelled by an extended Korteweg-de Vries equation. Abstract: Mathematics plays a crucial role in understanding and predicting weather and climate. I will give some examples of this that I have been, and am, involved with, and discuss the general prediction problem. Abstract: It is trivial to solve a system of constant-coefficients linear ODEs or a variable-coefficients scalar ODE, but how to solve (whether analytically or numerically) a system of linear ODEs with variable coefficients? This talk will take us on a journey across some unexpected themes in mathematics, e.g. Lie groups and algebras, graph theory, graded free algebras and geometric numerical integration, with a smidgen of highly oscillatory quadrature. In numerical weather prediction, data assimilation is used to combine observations of the atmosphere with information from a background field to obtain the most likely current state of the atmosphere. To be able to produce high resolution forecasts, we must use high resolution observations. This requires the correct treatment of observation statistics in data assimilation. We investigate convergence of the minimisation of a variational data assimilation system with correlated observation errors. We show that the minimum eigenvalue of the observation error correlation matrix is significant numerically and theoretically for the conditioning of the assimilation system. To reduce computational costs of the assimilation, we alter the eigenvalues of the observation error correlation matrix. Experiments with a 1D-Var system used by the Met Office for satellite retrievals demonstrate that using reconditioned observation error matrices in the assimilation improves convergence. In this talk, we will formulate and discuss the problem of density stratified interfacial flows in the shallow-water limit. This type of flow occurs in nature with the atmosphere and ocean as prime examples. We will focus our attention on the two and three-layer flows, without the so-called Boussinesq approximation which requires small density differences. The governing equations will be derived and its dynamics will be studied from both analytical and numerical points of view, particularly the issue of whether the solutions maintain hyperbolicity (i.e. wave-like behaviour). Oceanic eddies (or can be called random motions) play a major role in the large-scale ocean circulation. The eddies, which are prominent at length scales of 10-100 km and have a life span of a couple of weeks, can interact with the mean flow and are also capable of modifying it. Eddy effects are not properly resolved in ocean models because of their coarse resolution and many dynamical effects are not well predicted. The strength of eddy effects can be estimated by computing energy transfer across different length scales i.e. spectral energy fluxes. In this talk, I shall discuss some of these fluxes computed using real ocean surface data in different parts of the oceans. Kinetic energy fluxes show a strong transfer to large scales. In addition, fluxes due to eddy-mean, eddy-eddy interaction terms are also evaluated. The results indicate that mean-eddy interactions are quite strong. Finally, the results are interpreted from a point of view of two-dimensional turbulence. We present an approach to the problem of shadowing of the scattering maps for the NHIM in the absence of the transversality condition. We will also show the applications of our results to the ‘decision making’ problems. Regularity structures are a relatively new theory, which build on elements of the theory of rough paths. They allow to make sense of ill-posed SPDEs (such as the KPZ equation) which arise in some physical models. I will give an quick introduction to the theory, and show how it applies to controlled rough paths. Mathematical models have been widely and successfully applied in understanding the interplay of population structure and the evolution of social behavior. Here we ask whether helping and non-helping behaviour can co-exist in social groups, and importantly, what ecological factors affect this coexistence. We use two types of modelling techniques to examine this question. The first is an individual based model based on the lifecycle of social wasps and other colony founding species which compete for limited resource sites. The second is a mean field approximation derived from the individual based model. Both techniques use simple ecological parameters, such as number of offspring, effect of division of labour and dispersal distance. Using these two techniques, we find that the spatial structure of populations is critically important in allowing helping behaviour to evolve. Our broad approach to investigating helping behaviour highlights the importance of spatial effects in the evolution of social behaviours. Stochastic Approximations have been studied since the 1950’s as an important tool in various fields of pure and applied mathematics. We take a dynamical systems approach to this topic, based on theory developed by Benaim and coworkers; in particular we are interested in parameter dependent systems. We will present an example where a small change of this parameter critically changes the behavior of the overall dynamics. We consider the box-counting dimension of sets related to non-decreasing Levy processes (subordinators). It was recently shown in  that U(d)N(t,d) converges to t almost surely as d tends to zero, where N(t,d) is the minimal number of boxes of size at most d needed to cover a subordinator’s range up to time t, and U(d) is the subordinator’s renewal function. The main result is a central limit theorem (CLT) for N(t,d), complementing and refining work in . Box-counting dimension is defined in terms of N(t,d), but for subordinators we prove that it can also be defined using a new process obtained by shortening the original subordinator’s jumps of size greater than d. This new process can be manipulated with remarkable ease in comparison to N(t,d), and allows us to understand the box-counting dimension of a subordinator’s range in terms of its Levy measure, significantly improving upon [1, Corollary 1]. Corresponding CLT and almost sure convergence results for the new process are then given for all subordinators with fractal structure (those with infinite Levy measure). There is *no registration fee* and *free lunch will be provided* on the day for all participants. A financial travel support (up to £50) will be available for all shortlisted speakers or anyone presenting a poster. Please note that this is subject to our limited resources and we will be able to help on a first come first served basis. So don’t miss this opportunity and sign up as soon as possible! and receive a £100 voucher gift. The format of the contributed talks will be a 20 minutes talk plus 5 minutes for questions. Please note that registration is closing on the 9th of June and we can’t guarantee to accommodate late registrations. If you missed the deadline but you are still interested, please get in touch with the organisers and we will try to find a solution. We are pleased to announce our first ICL-UCL day on April the 3rd, 2017, held this time at Imperial College London. This is the first of what we hope a long series of events where people across different London universities will have to opportunity to get in touch with other students to talk and share their ideas and research in a friendly environment. We also are looking for 25 min talks contributed by PhD students(4 from each university). There will be a prize for the best junior talk! There is no registration fee and lunch will be provided, so don’t wait further and sign up soon to enter the competition. To submit an abstract for a talk send us an email at imperialsiam@gmail.com by Sunday 19th March and we will notify of the acceptance shortly after. Please use “Abstract ICL-UCL” as subject of the email. To register for the conference you have time until Sunday 26th March. Sign up of for a Free Improvisation Workshop for Mathematicians on 6th December (Huxley 341 at 1-3pm)! The improvisation expert Justine Jones will be leading a workshop on improvisation specifically designed for mathematicians. Snacks and drinks will be provided. Hey, SIAM gets social again! We will be in room 340 Huxley starting at 6pm. We are going to have snacks and drinks during the movie and pizza at the end. For that reason, please tell us whether you have any dietary requirements as well. Please, do sign up trough the form since we need to have an idea of the number of the participants.